A “Kopitiam” is a traditional coffee shop which is mainly found in Southeast Asia. One of the oldest Kopitiam in KL is Yut Kee Kopitiam which has been established in 1928. To this day, Yut Kee is still famous for its Hainanese-style breakfast such as the Hainanese Chicken Chop, Roti Babi, Roasted Pork with Apple sauce and so on. We were there on a public holiday. So yes, there is a huge crowd but it did not take too long to get a table. Based on a first come, first serve basis, make sure you leave your name and the number of diners with Mervyn, who is usually at the counter and he will let you know when your table is ready. Be prepared to share a table with others too. Four of us had the Traditional Malaysian Breakfast which was Half Boiled Eggs (RM 2.50) with Toasted Bread and Kaya (Coconut Jam) (RM 2.40). The Half Boiled Eggs was spot on and the bread was toasted to perfection. Together with the coffee, it was a good breakfast. We also ordered an extra Steamed Bread (RM 2.40). Compared to the toasted bread, the steamed bread was soft and fluffy. Simply delicious and melt in your mouth with butter and kaya. 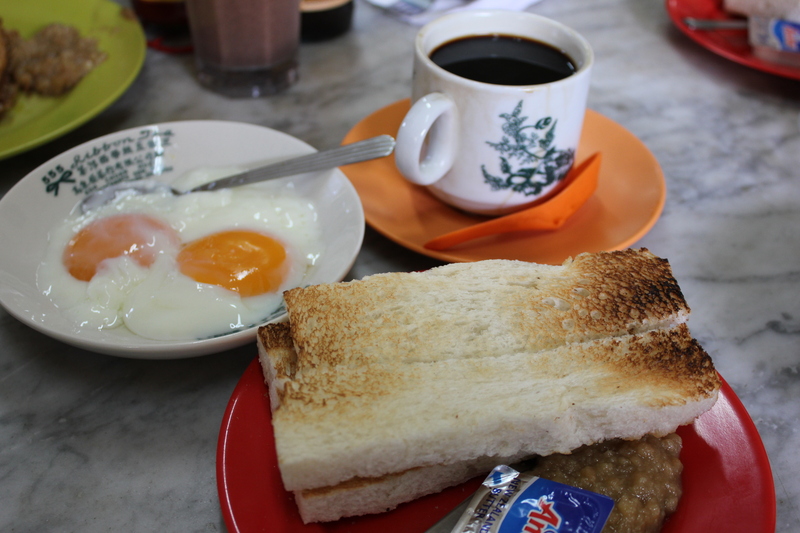 A Malaysian Breakfast : Half boiled eggs, kaya toast and coffee. Here is Reka’s review of the Chicken Chop (RM 8.50) : Trying out Hainanese breakfast for the first time with my best friend from Perth was an unforgettable experience. Out all the meals I had that morning, Yut Kee’s chicken chop dish stood out the most. Why? Well, as a Non-Malaysian my first impression of it was ‘Wait a minute, this is usually served at dinner…are these people confused or what?’. But the minute I took my first bite out of the chicken, I was amazed!!! The chicken was cooked to perfection; it was juicy and tender. The special brown gravy with its tangy, meaty flavour accompanied with mixed vegetables of peas, carrot, corn and fried potatoes added an extra oomph to the chicken dish. If anyone pops by to Yut Kee’s for breakfast, try out their chicken chop; you will be blown away. Yut Kee is still definitely worth a visit if you want to experience an authentic Malaysian and Hainanese Style Breakfast at a traditional Kopitiam. The Roasted Pork with Apple Sauce is also a must try too, which is only available on the weekends. For a good and hearty breakfast, with a traditional Kopitiam atmosphere in the heart of KL, who would not want to come back for more?